community of women that strengthens the church, supports its mission worldwide, and nurtures Christian faith through prayer and Bible study. 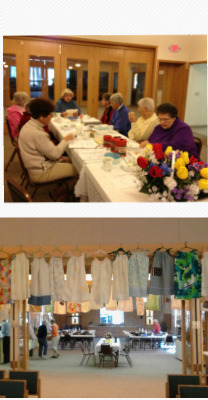 Our Guild meetings include activities such as fellowship, prayer, Bible study, and sewing projects for missions. In addition, we take pride in our accomplishments with organizing the church bazaar which is part of the annual Fleazaar. The Guild also offers unique service opportunities. For example, after memorial services, we provide meals for families and friends who have lost a loved one. These activities, and others, serve to strengthen our church and the community as a whole. Check our current calendar or call 715-543-2998.